C.W Tickner, author of "Humanarium"
C.W Tickner is a UK author and Terry Pratchett fan who's here to talk about his Humanarium trilogy., which is available on Amazon and Kindle Unlimited. Where and with whom do you live? Cambridge, UK. Fiance and the spirits of past pets. If you could co-write a book with any author, living or dead, whom would you choose? Terry Pratchett. The things he could inject into my story would have me in stitches. Where do you write? Sitting on a bed. Comfy, and with the ability to switch positions as aches dictate. What imaginary land would you choose as your home, and why? Any form of interplanetary vessel. Endless possibilities on where to go, where to eat and who or what to meet and discover. Space gypsy. What animal, real or imaginary, would you choose as your constant companion? A pocket-sized dragon, preferably orange in colour. But i’m not fussy. Your superhero alter-ego: T-Man: Able to produce excellent cups of tea that wow strangers and colleagues but burn the skin of any who oppose me. Historical period you’d like to visit: Feudal Japan. Favorite board, card or video game: Dungeons & Dragons, in any form. Title, genre and length? 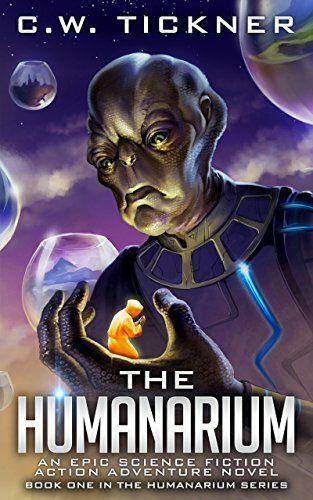 The Humanarium, science fiction, 177,000 words. When and where does it take place? In the future and on another planet, inhabited by giant aliens. How did you come up with the title? It’s a play on words; Humans and Terrarium. A place to keep humans. What inspired you to write it? I was cleaning out my fish tank one day and the thought occurred to me that I was in some way a god to the fish inside. (no god complex, honest). I realised that if I did not feed them or provide them with a landscape and companions, they would suffer as a consequence. I wondered how it would be if the roles were reversed and humans were on the inside. I figured I could swap “Fish” for “Aliens” and hey presto, a bizarre world was born in which humanity lives inside a fish tank. Is there a sequel in the works? The trilogy is out already and a fourth on its way. Where, how can you get it? Amazon store and in Kindle Unlimited. Describe your book in one word that most people don’t normally use. Fantastical. Who would want to ban it? Anyone with a phobia of giants or the premise that the “god” one might worship is in fact another creature with a greater intellect. To whom did you dedicate it and why? To my editor. He puts up with a lot. Name, age and occupation: Harl Eriksson, early twenties, blacksmith. Where and with whom does he live? Alone, on the outskirts of town, beside the “Wall” at the edge of the world. Who would play your protagonist in a movie? Adam Driver (Kylo Ren). What’s his celebrity crush? Anyone with blonde or red hair. He has never seen such a thing, having grown up in a tank with black-haired people only. What’s his biggest fear/phobia? Fear of being “Lifted” by the titanic hand that enters the tank and steals people from the world. Weapon of choice: The people around him. Worst habit? Demanding instant vengeance. Shane Lindemoen, author of "Breathless"